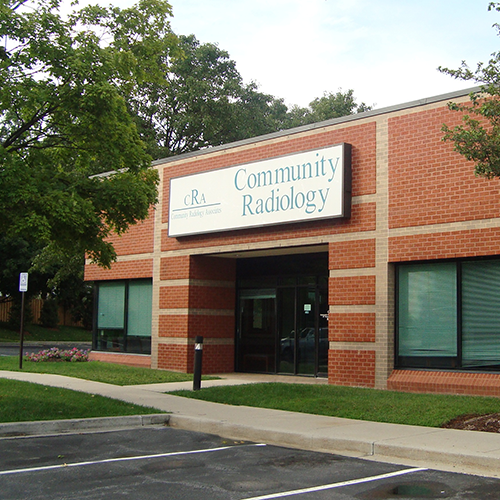 Community Radiology Associates | Frederick Imaging Center is part of a network of outpatient imaging centers located throughout Carroll, Frederick, Montgomery and Prince George’s Counties in Maryland. Our Frederick Imaging center offers a complete range of imaging services including 1.5T and 3T MRI. Both MRI units at this location have a wide-bore design to accommodate claustrophobic and larger sized patients. Other services include CT/CTA, fluoroscopy, bone density measurement and X-Ray. Frederick Imaging centers offers also offers the latest technology in women’s imaging, including 3D/4D obstetric ultrasound and 3D mammography. Expectant mothers need not visit an ultrasound portrait studio for 3D images of their baby; they will receive free 3D images when they visit us for a physician-prescribed ultrasound exam. Parents can also rest assured that their ultrasound exam is being performed by an experienced technologist and read by one of our expert radiologists who are trained to recognize medically important conditions. Frederick Imaging Center also offers a program called SnapIt that allows parents to share their ultrasound photos instantly online with family and friends through Twitter, Facebook, text, email, and more. Women who visit Frederick Imaging Center for their mammogram can elect to have 3D mammography performed, which is the latest innovation in breast cancer screening. Studies show that 3D mammography detects 40% more invasive cancers than traditional mammography alone. So when it’s time for your annual mammogram, trust our women’s imaging experts to bring you the very best. With the advanced knowledge of our expert radiologists, compassionate staff, and state-of-the-art medical imaging technology, we are able to offer you the most exceptional health care service possible. You can count on Frederick Imaging Center to provide timely, transparent, and accurate information about all aspects of your radiology exam. Community Radiology Associates | Frederick Imaging Center is conveniently located at 67 Thomas Johnson Drive, just 1.9 miles from Frederick Memorial Hospital. Our center is also less than a half mile from Fort Detrick, making it a great location for military families who are referred for a medical imaging exam. Our radiology center welcomes walk-ins for X-ray studies and is open on weekends to accommodate the busy lifestyles of our patients.